The other day I was basking in the joys of spring cleaning, when I stumbled upon an envelope dating back to 1993. I was about to shred it, but I did a double take when realized I had a treasure in my hands. 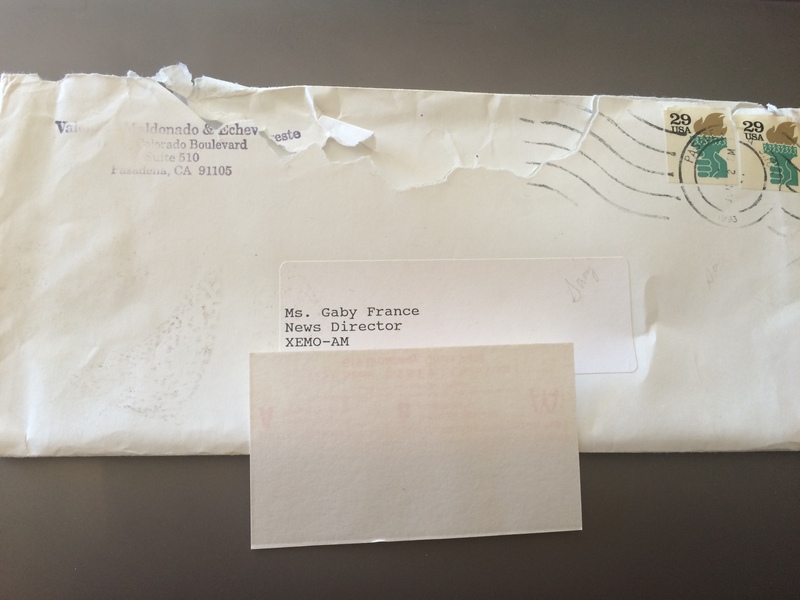 The recipient of the letter was my beautiful mom, Gaby France, who served as the news director for XEMO-AM, a popular Spanish-speaking radio station in Southern California (my dad was the general manager and business partner). Anyway, the sender was Valencia, Maldonado & Echeveste. “WAIT A SECOND,” I said out loud. “Echeveste?! I know that name! And wait…Echeveste from PASADENA? It’s gotta be the same Echeveste I know!” Goosebumps and awe immediately followed. 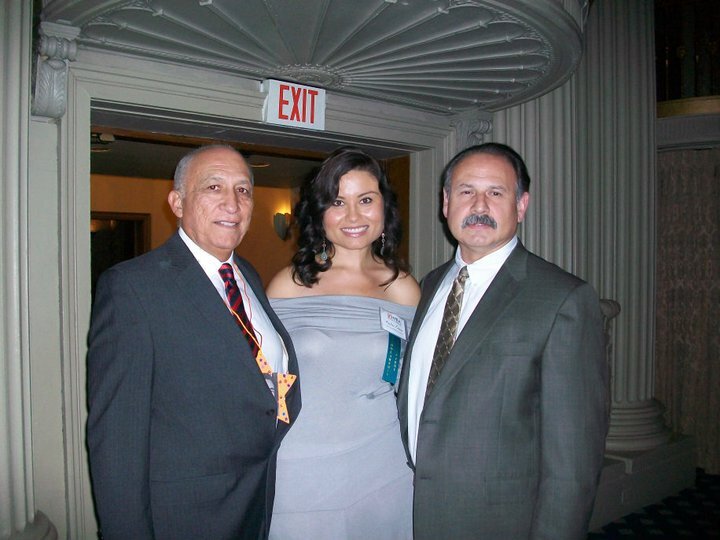 Valencia, Maldonado & Echeveste was a highly reputable PR firm based in Pasadena. They must’ve been pitching my mom on a client or something (the envelope was empty). Valencia, Maldonado & Echeveste turned into Valencia, Pérez & Echeveste, or VPE for short. VPE still exists, although sans Valencia and Echeveste, and remains in the very capable hands of the lovely Patricia Pérez. Are you with me? 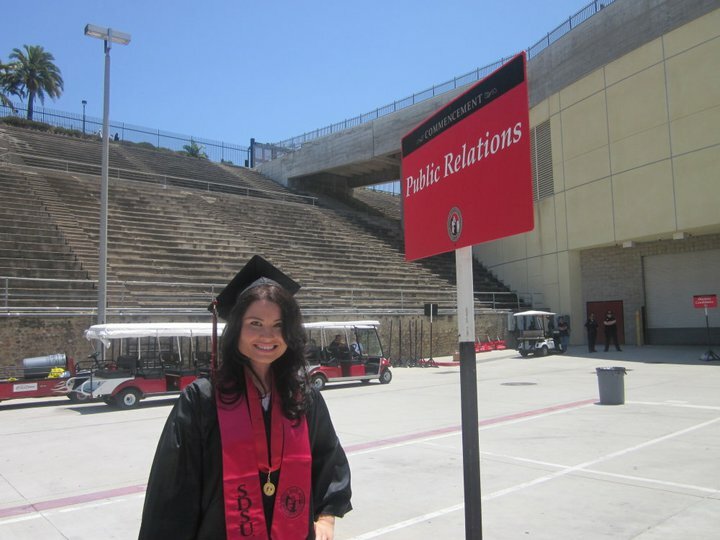 Ok, so fast-forward to 2010 when I was a college student at SDSU pursuing a degree in public relations. I applied for a scholarship through the Hispanic Public Relations Association (HPRA), and to my utmost delight was awarded. I attended a fabulous ceremony at the Millennium Biltmore Hotel in Los Angeles, where I met the founder of HPRA… none other than JOHN ECHEVESTE from Pasadena! That’s John Echeveste on the left, and David Garcia on the right. They’re both founding members of HPRA. And yes, that’s me in the middle. At that point, neither one of us knew there was a connection dating back to nearly 20 years prior. Echeveste became my role model and mentor, and we developed a wonderful work relationship. When I graduated almost a year later, I landed the internship of my dreams at Fender, the guitar company. They’re based in Scottsdale, and I was in San Diego, so that meant I had to move. I was broke but determined, and sent out a mass e-mail asking if anyone knew of a place for me to stay in Phoenix while I made a decent salary. Graduation day in May of 2011. Major milestone! Enter John Echeveste again (angels singing), who put me in touch with a wonderful Scottsdale family – the Hansons. Scott Hanson is the owner of a prominent PR firm in Phoenix called HMA. He and his amazing wife, Susan, welcomed me into their home knowing I was a recent grad earning internship salary. Had it not been for their generous gesture and Echeveste’s celestial introduction, I might not have been able to swing that internship at Fender, which soon became a full-time job where all my dreams came true. That marked the beginning of an immensely rewarding career. Can I get an amen on a Thursday?! And it gets better (and weirder). It turns out my boss at Fender, Jason Farrell (another amazing human being), shadowed Hanson at HMA back in the day when he was a college student at Arizona State University. I mean, come on. It was so written in the stars. Today, as I hold this envelope 23 years after it was mailed, there is no doubt in my mind that what is meant to be will find its way. That whatever seeds you and your ancestors sow will manifest in ways you never imagined possible, and when you least expect it. That the next person you meet at a networking event, at the supermarket, or anywhere else, might be your career fairy, next best friend, or a lesson to be learned… because it’s all written in the stars. So be a good person, meet new people and foster good relationships!